The next stage of the Winter Blanket CAL won’t be published until Boxing Day, so if you have been waiting patiently (or impatiently!) I have another CAL to keep you occupied until then. My aim is to raise some money for a great charitable cause – The Christie Charity. This is a UK cancer hospital charity and for those who don’t know about it you can read more here. This has been one of my favourite charities for many years. Not many people are aware of all the services provided by The Christie – two in particular are the Complementary Therapy and Art Sessions & Therapy, both of which are funded entirely by the charity. 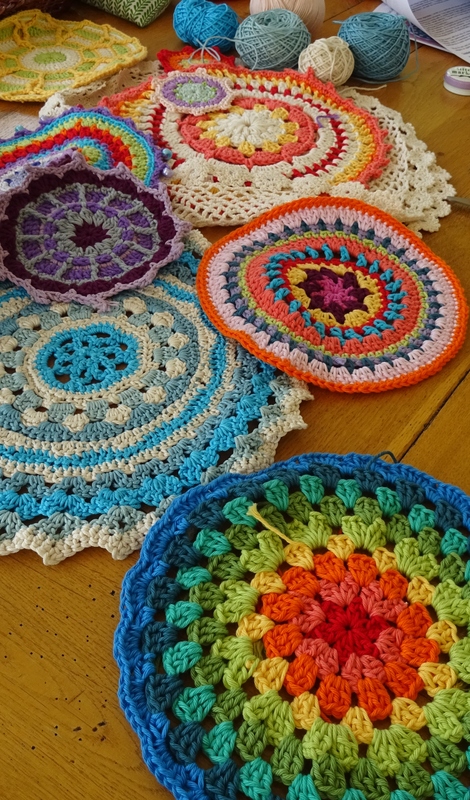 Mandalas are frequently used in colour therapy and meditation, and these fit very well with the Complementary and Art Therapies, and so it seemed a good type of CAL to use to support the charity. Who knows, one day crochet could feature in the alternative therapies used! The pattern will be available on Ravelry, and will be updated each day as new rounds of the mandala are published. A code will be published on the blog on Saturday which will allow you to obtain the pattern free until the end of the year. This makes the CAL accessible to all, which I hope will raise awareness of the charity. However, I will also publish links to a Justgiving charity page where you can donate to the charity; whether you wish to donate is up to you, as is the amount. In addition all proceeds from the sale of the pattern from Saturday until the end of 2016 will be donated to The Christie, so hopefully there will be ongoing benefits for the charity also. I used a dk cotton in up to 9 colours, using only small quantities of each, a 4mm hook and a tapestry needle. However, it could be made in any type or weight of yarn (although I wouldn’t recommend anything heavier than aran), provided you use a suitable hook size. The pattern is written in the round and uses no complex stitches, just chain, double crochet, treble, half treble and slip stitch. So if you know how to work these then you should find it straightforward. I will publish an update photo on the pattern each time new rounds are published, so you will have a visual aid as well. The pattern will be written in English crochet terms initially, but I will add US terms once the full pattern is published on Christmas Day. If you’ve never made a mandala before this should be a great one to try as there will be chatting and support on my Ravelry group. Good luck with this great project. The Christie is indeed a wonderful cause. I wish you every success.